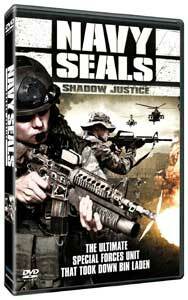 This week saw the release of 'Navy Seals: Shadow Justice' on DVD, and we have FIVE copies to give away. Although you can only win one each, you're almost guaranteed to win. Almost. The documentary from the Emmy Award winning George Forbes takes a behind-the-scenes look at the special forces unit that took down Osama Bin Laden. Enter the competition below. To get a taster of the DVD, pop along to Amazon, which has a short clip - unfortunately, it's not embeddable. Or simply enter away below to get a hold of the documentary that spent six years with the Navy Seals, giving us a thorough insight into their lives and missions. HOW TO ENTER: All you have to do is fill out the contact form below, inputting your full name, UK postal address (for nothing other than sending out your prize), and a valid email address - the winner will be contacted by email. If you don't win, 'Navy Seals: Shadow Justice' is also available to purchase at Amazon.co.uk.